Training specialist company Earth Flight Composites (EFC) was founded in 1991 by current owner Bert Groenewoud, who, amongst others in the aviation industry founded the SAE’s Commercial Aircraft Composite Repair Committee (CACRC) while working for KLM Royal Dutch Airlines Training department. The CACRC created standard recommendations, including best practice and recommended standards that can be found in the FAA AC (Advisory Circulars) and the EASA AMC (Acceptable means of compliance) but are as of yet not mandatory. As a consequence composite training still is in limbo; everybody can set their own standard and it is up to the competent authority to accept or not to accept then. EFC has however started to implement and embrace the recommendations. This will bring composite training by EFC to a higher level of learning and EFC has already implemented the SAE ARP (Aerospace Recommended Practices) and AIR (Aerospace Information Report) contents in each of the EFC training courses. Documents such as SAE AIR 5719 (recommended by FAA AC 20-107B and EASA AMC 20-29), AIR 4938C and the ARP 6262 are fully integrated in EFC course material and teaching methods. In time, these standards recommended by the FAA and EASA will become mandatory as more and more advanced composites are used in aircraft. EFC is dedicated to deliver all this and the knowledge gained over all these years to technicians in the industry. All EFC staff have over more than three decades of experience they can transfer to their attendees in their advanced composites courses. Now the company has opened a new training facility/workshop at the Regional Aviation College of Amsterdam in the Netherlands. EFC’s home base is located in the nearby city of Hoofddorp. The new training facility was created using the ARP (Aerospace Recommended Practices). Health and safety for the trainees is a major priority in its arrangement. 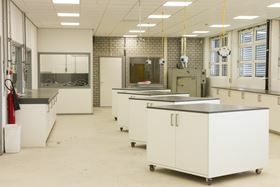 It has a large temperature controlled clean room, wet lay-up/VIP resin infusion room, machine room and trim room. Each training room can accommodate 16 students at a time. Each workbench in the trim room has been fitted with a dust extraction system, compressed air and vacuum connectors, a ventilating system for fresh air supplied by heat exchangers. The machine room has been fitted with a circular saw machine, large belt sander, a band saw and pillar drill machines each connected to dust extraction system. This story is reprinted from material from EFC, with editorial changes made by Materials Today. The views expressed in this article do not necessarily represent those of Elsevier. Liz Nickels looks back at the groundbreaking composite commercial spacecraft eleven years on.